In many ways, algebra can be as challenging for teachers as it is for students. With so much emphasis placed on procedural knowledge and the manipulations of variables and symbols, it can be easy to lose sight of the key ideas that underlie algebraic thinking and the relevance algebra has to the real world. In The Xs and Whys of Algebra: Key Ideas and Common Misconceptions, Anne Collins and Linda Dacey provide a set of thirty research-based modules designed to engage all students in mathematical learning that develops conceptual understanding, addresses common misconceptions, and builds key ideas that are essential to future learning. For use in seventh- to ninth-grade courses focused on an introduction to formal algebra, this flipchart emphasises five essential algebraic concepts: using variables meaningfully; using multiple representations for expressions; connecting algebra with number; connecting algebra with geometry; and manipulating symbols with understanding. The thirty research-based modules in this spiral-bound flipchart are designed to engage all students in mathematical learning that develops conceptual understanding, addresses common misconceptions, and builds key ideas essential to future learning. Following the recommendations of the National Council of Teachers of Mathematics and the Common Core State Standards, the modules at this level are organised into three sections: Expressions, Equations, and Functions. Each module begins with the identification of its mathematical focus and the potential challenges and misconceptions associated with those ideas. The ""In the Classroom"" section then suggests instructional strategies and specific activities to implement with students. The ""Meeting Individual Needs"" section offers ideas for adjusting the activities to reach a broader range of learners. All modules are supported by one or more reproducibles (located in the appendix), and the ""References/Further Reading"" section provides resources for enriching your knowledge of the topic and gathering more ideas. |In many ways, algebra can be as challenging for teachers as it is for students. With so much emphasis placed on procedural knowledge and the manipulations of variables and symbols, it can be easy to lose sight of the key ideas that underlie algebraic thinking and the relevance algebra has to the real world. In The Xs and Whys of Algebra: Key Ideas and Common Misconceptions, Anne Collins and Linda Dacey provide a set of thirty research-based modules designed to engage all students in mathematical learning that develops conceptual understanding, addresses common misconceptions, and builds key ideas that are essential to future learning. 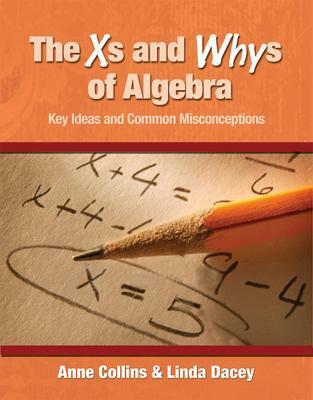 "With plenty of sample exercises, The Xs and Whys of Algebra is a vital addition to any community library collection dedicated to teacher's resources." - Midwest Book Review "With plenty of sample exercises, "The Xs and Whys of Algebra" is a vital addition to any community library collection dedicated to teacher's resources." - "Midwest Book Review"